baha’is of canada elect governing body | doberman pizza. A little late, but here’s the Canadian Baha’i News Service reporting on the election of the National Spiritual Assembly of the Baha’is of Canada. 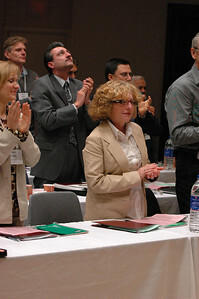 TORONTO, ON, 01 May 2007 (CBNS) — Over 150 delegates from across Canada gathered at the Toronto Bahá’í Centre this past weekend, 27 to 29 April 2007, to elect the national governing body of the Bahá’ís of Canada, the National Spiritual Assembly. The elections were part of the annual National Convention during which locally elected delegates consulted with the National Spiritual Assembly about issues of importance to Bahá’ís, particularly community activities centred on the moral and spiritual development of children and youth. Elected to the National Spiritual Assembly for a term of one year were Judy Filson, Karen McKye, Gordon Naylor, Borna Nourredin, Enayat Rawhani, Fariborz Sahba, David Smith, Susanne Tamas, and Mark Wedge. The election, like all elections of Bahá’í institutions, was conducted by secret ballot, with no campaigning or even discussion of individual personalities. Instead, delegates based their individual choices on criteria laid out by the central figures of the Bahá’í Faith. A day of preparation for the delegates took place on the Thursday prior to the Convention, in which participants explored their role as delegates and the purpose of the convention. Part of the consultation revolved around a recent letter from the international governing body of the Bahá’í community that emphasizes the spiritual nature of Bahá’í elections and recommends, in addition to the qualities cited by Shoghi Effendi, such criteria as age distribution, diversity, and gender when voting. Louis Brunet (elbi.smugmug.com) took the photo featured above: he’s posted photos of the national convention [set 1, set 2] on his photoblog. This entry was posted in baha'i blog and tagged news, photos by danger. Bookmark the permalink.